'Baahubali’ review: SS Rajamouli's film holds out many promises: of adventure and romance, love and betrayal, valour and weakness. And delivers magnificently on each of them. Anushka Shetty in Santhosh Sivan’s mythological film? Baahubali movie review: Right from its opening frames, ‘Baahubali’ holds out many promises: of adventure and romance, love and betrayal, valour and weakness. And it delivers magnificently on each of them. Right from its opening frames, ‘Baahubali’ holds out many promises: of adventure and romance, love and betrayal, valour and weakness. And it delivers magnificently on each of them. This is full-tilt ,fully-assured filmmaking of a very high order. ‘Baahubali’ is simply spectacular. Many films have scale and spectacle. ‘Baahubali’ also has a story. And enough hooks to keep us engrossed through its close to two-and-a-half hours of running time. You can see S S Rajamouli’s varied influences in places : James Cameron-like dreamy vistas of hill, waterfall and greenery, Ang Lee’s flying-through-the-air-acrobatics, Peter Jackson’s stretching-out-for-miles crowded battlefields, J R R Tolkien’s plug-ugly trolls who talk in guttural tongues, many characters and situations from Mahabharat and Ramayan. And, in a Bollywood hat-tip, to the long-suffering mother in ‘Karan Arjun’! But Rajamouli makes sure that the references do not overwhelm his epic, which has a beleaguered kingdom, kings and queens, faithful slaves, jealous brothers, beautiful women and strong men. And the strongest of them, ‘Baahubali’, which means, literally, ‘strong of arm’. Strapping Shiva (Prabhas) has a strange fascination for a faraway mountain peak, where he can see the outlines of a castle. His attempts at leaping across cliffs first leads him to the beauteous Avantika (Tamannaah) and her group of rebels, and then to the distant kingdom which has the tied-up-in-chains-for-twenty-five-years Devasena (Anushka Shetty), suffering the indignities heaped upon her by the cruel King Bhallala (Rana Daggubati) and his father (Nasser). Rajamouli doesn’t bother giving us a date for the film. It is closest to a ‘period’, part myth, part everything else. Which is a good thing because we don’t go looking for parity in costume and architecture. It is set in the director’s own imagination, and what a wonderful thing that is, full of gorgeous visuals (just those waterfalls make you feel like you’ve been drenched), and a story-telling technique that eschews unnecessary sophistication just for the sake of it, but is robustly elegant all the same, and keeps things ticking space. Prabhas plays it just right: his Baahubali has a sprightly ‘moochh’, and is mightily muscular. So is Daggubati, whose spread of shoulder and chest is even more so. The women step in to be fiery and authoritative, as well as, sigh, submissive. When Ramya thunders, she is quite something; Tamannaah displays a mean kick before simpering, and the ladies step aside to let the men, and ‘maar-dhaad’, occupy centre-stage. I have to say that I dread long-drawn skirmishes between armour-clad armies (having suffered through Jackson’s never-ending battles) because they turn so turgid and dull so fast, but the battle-scenes in ‘Baahubali’ are completely engrossing. There’s just one place that I tuned out, and that was a ‘romantic’ song which feels unnecessary and superfluous to the proceedings. But it is quickly over, and we are back to the action. 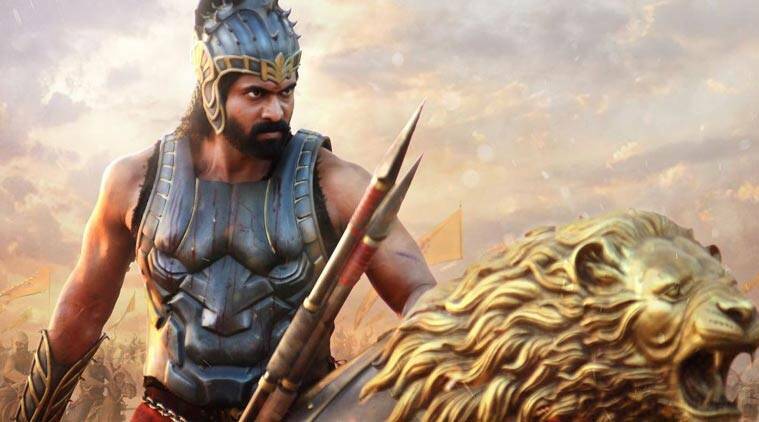 Rajamouli’s ‘Magadheera’ posted notice of a director worth watching: I saw the film much after its release, and was impressed by the re-creation of the past ( the present, full of silly banter between a standard-procedure hero-heroine, was same-old). And then came ‘Eega’, a terrific, fun-filled tale of a vengeful fly. With ‘Baahubali’, Rajamouli has combined his gifts, of staying firmly in the past, and filling it with heightened drama and colour-drenched visuals. I can’t wait for the second part, which, we are told, will be out in 2016.